Proper nutrition, hydration, and exercise are the secrets to a healthy, young-looking skin. Couple this with a high-quality moisturizer, and you can fight the effects of aging. Finding the best moisturizer for dry aging skin is a tough task, especially in a niche that is crowded with so many brands. How do you know if a particular product is safe or effective? Check out our handy shortlist for a better idea. All the products featured here are bestsellers, and have excellent ratings and very positive reviews. Peptides are a word commonly associated with anti-aging products. Chains of amino acids that can efficiently make wrinkles disappear, they are at the core of this moisturizer from Amara. The cream contains half a dozen powerful organic ingredients. They work together to improve your skin tone, texture, and elasticity. This is a potent cell renewal cream that aims to rejuvenate your skin by nourishing it with natural vitamins and antioxidants. The cream is light and non-greasy, and gets readily absorbed by your skin. This product contains no artificial dyes, fragrances, or parabens. The hydrating effects of coconut oil is what sets apart this organic cream from Advanced Clinicals. This cream will rejuvenate your skin and help fight the effects of aging, like wrinkles and sagging skin. It is the perfect tonic for dry and sensitive skin. While coconut oil may be the base ingredient, this cream is further fortified by the likes of organic lavender and chamomile. The cream has an effective three-in-one action. It moisturizes your skin, fights aging, and can even be used to condition and nourish your hair follicles. This is a very trustworthy formula that contains no harsh ingredients like parabens. It also has the pleasant coconut smell. The name Vaseline requires no introduction in the world of skin care. This is a product designed by the legendary brand specifically for mature and aging skin. It is a great product for women at or nearing menopausal age, as it targets skin dryness symptomatic of this stage of life. The lotion improves the skin structure, balancing it using ingredients like vitamin B3. To boost your skin’s rejuvenation and renewal potential, the lipid levels need to be boosted. This lotion does precisely that, using ingredients called PPAR activators. Enriched with the power of pure almond oil, this is a clinically proven formula to fight dryness. If you have very sensitive skin, the advanced formula used in some creams may cause itchiness or rashes. Cetaphil provides moisture and hydration that is long-lasting. It helps prevent moisture loss in aging skin, and uses a special formula that attracts water to your skin cells. The cream is rich and non-greasy. It is absorbed very quickly by the skin, and leaves no messy traces. This is a great option if you have sensitive skin and suffer from intense post-menopausal dryness. This is a protective and moisturizing lotion from Aveeno, suitable for very dry and sensitive skin types. It is a nourishing lotion, fortified with the natural goodness of oat milk. The moisturizing effects of this lotion have been proven clinically, and this is a brand commonly recommended by dermatologists. The formula uses rich, natural ingredients, and does not contain any chemical allergens. This is a fragrance-free formula, which helps protect your skin using colloidal oatmeal. It also attracts moisture to your skin more effectively. This is a very well-known brand, with products that has been used across generations. 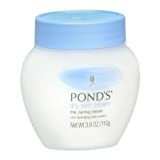 The Pond’s cream is a very trusted product, and has been dermatologically tested for potential allergies. It is a great option for sensitive skin, as it contains no harsh chemicals, and has a gentle moisturizing action on your skin. The formula contains compounds called occlusives, which help prevent moisture from leaving your skin. This effect is enhanced by the presence of another group of ingredients called humectants, which hydrate your skin deep into the pores. The product is not greasy, and is readily absorbed. THE BEST FACE MOISTURIZER CREAM FOR STRONGER, HEALTHIER SKIN. Feed your skin the vitamins, minerals and amino acids it needs for optimum health with our robust 10-in-1 facial moisturizer. Get healthier, stronger, happier looking skin or YOUR MONEY BACK! SUPERFOOD FOR YOUR SKIN - Extra robust facial cream organic Aloe Vera, Manuka Honey, MSM, Coconut Oil, Shea Butter, Blue Green Algae, Olive Oils, Cocoa Butter and Hemp Seed Oil with vitamins A, B, C, E. One of the most nutrient-rich natural face moisturizer on the market today. DEEP HYDRATION- Our natural face cream will moisturize to the base of your skin, not just on the surface, which lasts up to 8-12 hours. Non-greasy formula fully absorbs and leaves no residue to be the best face cream for dry skin. A little goes a long way to instantly soothe dry, damaged skin. REPAIR AND PROTECT- The perfect anti aging face cream and night cream with ingredients shown to repair damaged cells, stimulate new cell growth, stimulate collagen production, strengthen fibers, improve elasticity, protect from damaging free radicals while reducing fine lines and wrinkles. AS SAFE AS IT IS EFFECTIVE- Organic face moisturizer made for sensitive skin. Non-oily and won't clog pores so safe to use on face, hands, body and feet. No toxins, fragrances, fillers, alcohol or parabens. Since Complete works with your skin's natural biology-it's the best face cream for all skin types whether dry, oily, combination or damaged skin. LOVE IT OR YOUR MONEY BACK. This moisturizer uses a bunch of superfoods in its formula to drive nutrition and moisture to your skin. It contains exotic ingredients like manuka honey, which is combined with other traditional cosmetic ingredients like aloe vera and coconut oil. The other organic compounds that complete the list include shea butter, algae, cocoa butter, and hemp seed. This is a product designed to provide deep hydration over 8 to 12 hours with a single application. It has a very non-greasy feel, and only a little is needed at one time. The cream can repair damaged cells, and has strong anti-aging effects.  MADE WITH CERTIFIED ORGANIC INGREDIENTS - FREE OF HARMFUL TOXIC PETROCHEMICALS: As such, it contains Star Anise Seed Oil, which gives it a natural, mild licorice scent. This evaporates shortly after application. Our unique blend of ingredients is formulated using our proprietary manufacturing method, which allows our formula to be free of harmful, toxic petrochemicals (as preservatives or otherwise) giving your skin only the nutrients it needs.  NON-COMEDOGENIC. GREAT FOR SENSITIVE SKIN: Fights off free radicals (the root cause of premature aging). Naturally aids the reduction of fine lines, wrinkles, while deeply moisturizing the face, eye, neck and décolleté. Formulated for deep moisturization and absorption. No fillers or binders. The cream is VERY concentrated. A little goes a long way. Every ingredient has a beneficial effect on the skin, leaving it nourished, moisturized, healthy, smooth and radiant.  GENTLY & THOROUGHLY MOISTURIZES WITHOUT STRIPPING, DRYING OR LEAVING BUILD-UP: Our cream softens, repairs and reverses damage with natural healing, anti-aging ingredients. Perfect for all skin types. Improves condition of the pores. Hypoallergenic. NO Harmful Chemicals: NO SLS, SLES, Propylene Glycol, Propylene Glycol Derivatives, Parabens, Sulfates, Dyes, Synthetic Fragrance or Preservatives. You can be beautiful at any age. You don't have to use chemical laden cosmetics, needles or surgery.  CRUELTY FREE. NO ANIMAL TESTING. 100% SATISFACTION GUARANTEED: Our products are prepared fresh regularly to ensure their optimum best when you receive them. We guarantee purity and freshness for at least six months from purchase. Should anything appear unsatisfactory within that time, simply let us know and we will make it right. NOTE: WITH EVERY PURCHASE, WE INCLUDE OUR FREE HOW TO GUIDE FOR BASIC SKIN CARE, WHICH CONTAINS TWO DIY RECIPES FOR NATURAL FACIAL MASKS.  THE MISTAKE THAT CAN COST YOUR SKIN'S YOUTH: Fresh, vibrant skin says a lot about a person. The question is, how do you maintain the freshness and vibrancy of youth, naturally? No one ever said they wanted to grow up and have invasive surgery, skin injections or laser treatments. It's expensive, scary, and it often looks quite artificial. There is a solution, though. Human skin is a living organ with the ability to absorb what is applied to it. This is where our products come in. 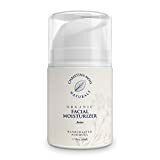 If you are looking for an elegant product made with organic ingredients, this is the best moisturizer for dry aging skin you could purchase. It contains no artificial chemicals, fillers, or binder, and it’s very gentle on sensitive skin. As it is very effective in fighting free radicals, this cream also has a proven anti-aging effect on your wrinkles and lines. The cream is readily absorbed by your skin, and is very lightweight. It does not leave any heavy traces or deposits, and provides excellent hydration. One of the key ingredients is organic star anise extracts, which gives this cream its gentle licorice-like smell. If you want to beat the effects of time, why not look at a product called timeless? This product combines the power of collagen and elastin to combat wrinkles and fine lines. It moisturizes your skin, making it more elastic and youthful. The deep hydration provided by this cream makes it the second-best moisturizer for dry aged skin on our list. It is a very gentle formula, and safe for all skin types. The formula uses only natural herbal and botanical ingredients, and contains no harsh chemicals or parabens. You can expect visible effects within days of use. 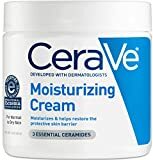 This is a very effective and safe daily moisturizer for all skin types, especially the dry and sensitive ones. It provides effective hydration for up to 24 hours. The presence of hyaluronic acid in this cream helps it to retain moisture inside your skin, rejuvenating it. Your skin will become more elastic and youthful with the help of potent ceramides. These compounds create a protective barrier for your skin, helping it fight against cell damage. This gentle and fragrance-free formula contains no harsh artificial ingredients like sulfates or parabens. It comfortably wins the title of the best moisturizer for dry aging skin on our list. Collagen, peptides, hyaluronic acid, ceramides… the list of healing compounds that can prevent the signs of aging is endless. These are the main active ingredients in the products included in our best moisturizer for dry aging skin list. With regular application of these compounds, and a healthy diet and lifestyle, you can keep looking young for ages. Did you manage to find the best moisturizer for dry aging skin you want to purchase? Leave us a comment down below.